Tetiaroa atoll is located in the Society Islands of French Polynesia. The international airport is located at Papeete on the island of Tahiti. The Brando Hotel is a lavish new eco-hotel located on the French Polynesian atoll of Tetiaroa. The hotel and atoll, owned by Marlon Brando, is set to open in 2008 and will be the only hotel on the whole island. 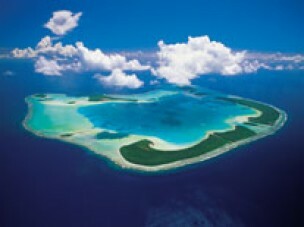 Tetiaroa atoll is 20 miles north of Tahiti and is located in Tahiti’s Society Islands. Marlon Brando bought the island in 1965 after falling in love it while filming “Mutiny on the Bounty”. This environmental project will consist of 30 deluxe fares (villas) and is set in a beautiful and unique setting. Tetiaroa is the former playground of Tahitian Kings and is virtually uninhabited. There is a beautiful crystal blue lagoon which also has 13 motu (small islands) surrounding it offering a paradise of ecological importance. The Brando Hotel will be located on Motu Onetahi and will be the only hotel in Tetiaroa – the rest of the atoll will be set aside as a private natural preserve to protect the environment. The hotel will be exactly how Marlon would have wanted it – energy autonomous and built with natural materials. It will also showcase the latest in renewable energy technologies. A full time marine biologist and veterinarian was employed to ensure that such a project would not disturb the flora and fauna of this eco system which houses a sea turtle hatching ground, and a designated seabird sanctuary. The archeological department of Tahiti Museum was also called in to conduct research into the past use of the atoll by Tahitian royalty. More details and photos to come - opening in 2008!